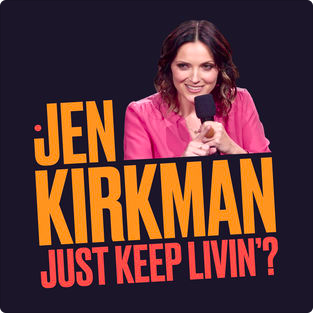 Released as Kirkman’s second Netflix special in January 2017, Just Keep Livin’? the album (including 17 minute bonus content) is NOW available digitally on AMAZON and ITUNES. The digital download includes a 17 minute bonus track that you didn’t see on Netflix. Or if you want to be sent a digital download card (with bonus material) and get a free signed poster - you can purchase Just Keep Livin’ directly from AST RECORDS. Rooftop Comedy is proud to release the comedy album version (July 2016) of Jen Kirkman's "I Am Gonna Die Alone (And I Feel Fine), which contains material from the special of the same name, streaming now on Netflix. IGDA was named one of the Top 10 Specials of 2015 from The Atlantic and Time Out NY. HAIL TO THE FREAKS was recorded in December of 2010 at the Upright Citizens Brigade theatre – and was released in March of 2011. It hit #13 on the Billboard best-selling comedy album charts, Jen continues to draw you deep into her psyche through more stories of paranoia, self-doubt, and commitment. CD version includes a bonus disc of extra material.